For a long while there was a dream that I had, to conduct the Kanabhishekam of my mother. A Kanabhishekam is typically done by the Great Grandson for his Great Grandparents. It usually culminates with the Ayush homam of the Great Grandson. It is a beautiful, solemn ceremony where the Great Grandparents have a ceremony similar to a Sashtiabdapoorthi or a Sataabhishekam. However, an abhishekam is also done with gold coins, of a certain denomination to be distributed to all the children in the family. The gold that is given from a Kanabhishekam is saved for posterity with the family and is never given away or sold. Similarly, a Sishya - a disciple - can also do the same to the Guru.Which is the route I took. I have been trying convince my mother for years, who said that the society would criticize if she let me do something like this. I, for one, have always been someone who never really cared much about what society would think, especially in cases like this. Where it is an expression of respect and devotion to my mother and Guru. We had extremely few people, friends, who are more like family without whom conducting this event would have been impossible, all by myself. To protect the privacy of those who attended the ceremony I am sharing only pictures that have mom and I.
I realized most people do not know what a Kanakaabhishekam is and I am sharing this because I want everyone to know that there is a special ceremony like this and I urge you, to honour your parents/Gurus thus, if you can and if God wills it. The photographs are taken by Third Eye Prakaash. God Bless! In a generation where kids look for ways to get rid of parents.. it such a heart warming feeling to see people like you too iterating the belief good people exist too. Good bless you. All love and respect to you Chinmayi! amma and u, have always taught me something or the other. No wonder, im jus ur proud follower and love grasping knwledge from this social website(s). Right from the fact of 'loving/respecting one's mommy' to 'voice over artiste' always wanted something like urs. Well, im nt keeping an evil eye on u, jus an happy smiling eyes. May God bless u every second of ur life. *high five* sahana lady. God bless you Chinmayi. May all your dream come true oneday. May you both find happiness, peace, love and everything you wish for in life. My prayers are with you. And Thank you for explaning about this ceremony. You and mom look lovely together. A great way to show your love and respect towards her. You will always be a special person in my life. Tears in my eyes... don't know why! God Bless you both!! A very nice gesture by you....God Bless you both and give all the strength for a wonderful days ahead. Respect and God Bless! What a validation for the timeless Tamil quote " Annaiyai pol oru dheivamum illai"
appreciate your love and respect towards your Mom. Matha, Pitha, Guru, Deivam. I see, for you all four forms is your Mom. Let me pray the Almighty to give health and happiness to both of you. MAy God bless you and your mom with all you desire. All the best. Hi Chin, Good to see these photos. God bless you both. u r a proud daughter of Mrs. Padmhasini. This is the way u can show ur gratitude to her whom has sacrificed her career and almost everything to bring u up. 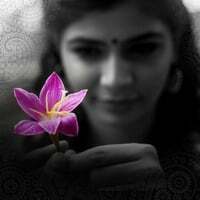 Chinmayi what u r today is only because of ur mom. The woman behind you. Luv to both of you. And the way you explained abt Kanakabhishekham was fantastic. It is very nice of you Chinmayee to conduct Kanabishekam ceremony to glorify your mother and motherhood..looks beautiful. Your mother should be very proud of you for all your achievements so for and the ones to come..and being a great daughter. Both are lucky to have each other...very nice. All the best! Grt thought.Good message to the Young generation. Read this post on a random visit to your blog. That is how a mom always is! You have made her proud and that itself is the greatest happiness in her life. And your act of performing Kanakabhishekaam as a mark of gratitude is one more feather to her cap for being a worthy mom. May she be blessed with long life and best of health to be a moral support for you forever! Love and more respect to my dearest Chinmayi :) God bless! God bless! Have great respect for your mom - 'cos all that I know from what you have said in interviews and what you have written here and ofcourse from what you are!. You look more serene in these photos than any others that I've seen of you. May all your dreams for your mom and yourself come true. Though its late to comment, but once I saw you & your amma's photos in your website, I can't resist my eagerness to comment a few lines. The relationship and obligation from u towards ur amma in 20th century is just a example to today's young generation. God bless you. Long live and stay happy for ever.